On the left, Vincent van Gogh, Mousmé , 1888, National Gallery of Art, Washington. 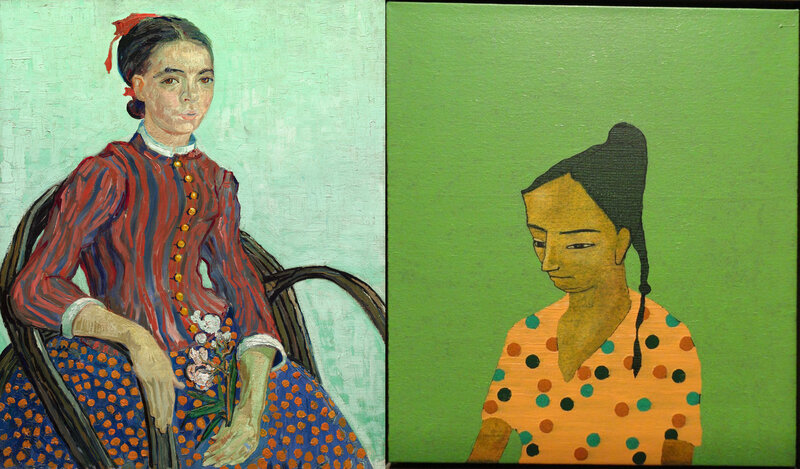 On the right, Stephen Chambers, Woman (Green Background) , 2006, private collection, London; currently on display at the Pera Museum, Istanbul, where I saw it on Saturday, June 21, 2014, and made the (slightly tilted) photograph on the right below. I did not know of the artist Stephen Chambers before. The green background of his Woman, and her expression, caused me to think of van Gogh’s Mousmé. The Mousmé’s head is round, but her dotted skirt is as flat as the blouse of the Woman. This entry was written by David Pierce, posted on June 30, 2014 at 2:43 pm, filed under Istanbul, Visual Art and tagged 2014, National Gallery of Art, painting, Pera Museum, Stephen Chambers, van Gogh, women. Bookmark the permalink. Follow any comments here with the RSS feed for this post. Post a comment or leave a trackback: Trackback URL.